The heart of any modern sporting rifle is the upper. This is where the magic takes place and where most of the mechanics reside. The factory Ruger AR-556 upper is solid as a rock, but not exactly high performance. 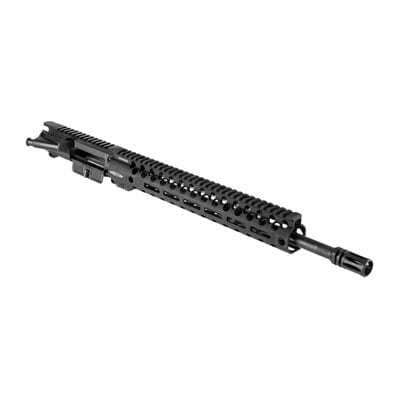 An upgraded upper can greatly improve performance and reliability. In our article, we will help you learn what a great upper receiver should have and detail some of the best on the market for you to review. Uppers can come complete or stripped. Even stripped uppers, lacking a bolt carrier group, charging handle, and muzzle device, still include a lot of components. Plus, you will have to select those missing components separately. First, you must consider the fit, finish, and quality of the upper body itself. Not all are strictly mil-spec. As with most things, look for an upper from a reputable manufacturer. The barrel is always the most crucial element of a firearm. Here, you must consider the material, manufacturing process, twist rate, and finish. Cold hammer-forged Chromoly steel is a popular option. The military uses chrome-lined barrels to extend their longevity, but non-lined barrels are slightly more accurate. You can go lightweight or with a heavy barrel for heavy shooting. Uppers usually come with a handguard. Drop-in handguards are easy to install and good for mounting bipods, but free float ones maintain accuracy by not affecting barrel harmonics. Vents and mounting rails are also key for a handguard to dissipate heat and allow you to mount the right accessories in the right places. There is a lot to keep in mind with uppers, but for the most part, it boils down to your preference. Make no mistake, the factory original Ruger AR-556 upper is a rock-solid piece of equipment. Having said that, it's build quality, performance and reliability are roughly equal to a military issue M4, which means, not exactly surgical. One perk of upgrading your upper is sheer performance. A high-end bolt group with perfectly designed feeder grooves and an ergonomic charging handle can turn a tool into a precision machine. Remember that of all a firearm's components, the barrel is the most crucial, so significant upgrades in quality or twist rate can make a world of difference in accuracy. The classically styled factory Ruger handguard and top rail are nothing to write home about. Personally, I like handguards with acres of Magpul's M-LOK mounting slots on them, because they don't impede ergonomics and double as heat vents. KeyMod works much the same way. Besides practical considerations, not to mention the opportunity to drop some ounces, a new upper can really be a personal statement. The features and aesthetics you choose can really help you feel that you own the rifle in a deeper sense. It may seem strange, but such little psychological switches can prompt you to practice more and boost your confidence and performance with your gun. There are a bewildering array of AR uppers on the market, but we have sifted through and found the best products to update your Ruger AR-556. Daniel Defense was founded in 2002 in Savannah Georgia. It has gained an incredible amount of respect in the AR-style rifle field in that time, partly through having picked up some military contracts to provide gear to both American and British special forces. That exact expertise is what has inspired this upper. The main body has been CNC machined out of a billet of 7075-T6 aluminum which is then Type III hard coat anodized. Pretty standard stuff on an AR. The barrel stands out a bit more, being cold hammer forged out of Chromoly vanadium steel. It has a carbine-style length of 14.5 inches. Inside, the bore has a chrome-lined 1:7 twist rate. The outer finish is a phosphate coating. The direct impingement gas system is low-profile hardened steel with a mil-spec heavy phosphate coating. Sights are not included. 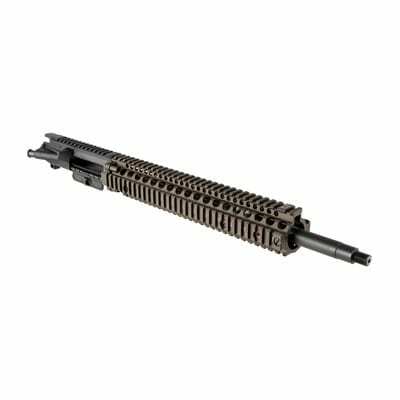 The free float handguard is also CNC machined from high-grade aluminum and features circular vents and full-length universal SOCOM-style rail systems on all four sides. These are made of a material called Santoprene, which offers heat resistance up to 300° F.
This upper also features indexing marks on the rails and M4-style feed ramps. It is made in the U.S.A. with a 100% satisfaction guarantee. This is a top-of-the-line AR upper built by a company with a stellar reputation. The best features are the unbeatable build quality and materials, especially in the barrel. As one of the nation's top firearm and firearm accessory dealers, Brownells has seen it all and has the inside track on what shooters want from an AR upper. They make many of their own high-quality products, and this item is no exception. It features a standard 16-inch barrel with a 1:8 twist rate, great for mid-to-heavy bullet weights. 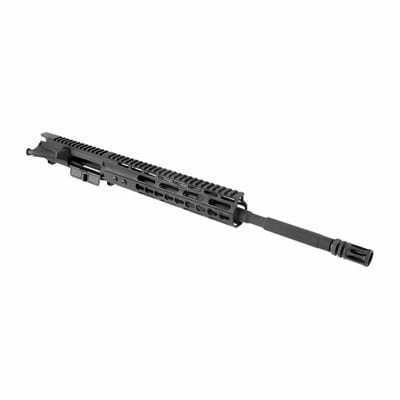 The receiver has a standard 13-slot universal rail which aligns with the ten-inch handguard. The handguard has aggressive venting, aided by the open and ergonomic KeyMod mounting system arranged along three surfaces. It covers a low-profile gas block. Back on the receiver, a dust cover and forward assist are both included. Not included are the bolt carrier group and charging handle, allowing you to customize your weapon to your heart's desire. These are made in the U.S.A. and are covered by Brownell’s lifetime warranty. This is a simple but well-thought-out AR upper. The main benefit over your stock Ruger AR-556 is the array of mounting systems it includes. The vents with the KeyMod slots give a pretty sleek and lightweight look while offering a great mounting platform. The full-length rail along the top of the handguard is also something that the stock AR-556 is sorely lacking. For the price, this product is very hard to beat, especially given the warranty. Nothing says classic AR like the name Colt. Few companies have a more storied and legend-filled history as Colt, going back to the 19th century. This upper is a recent development from Colt, an upgrade from entry-level options such as the stock Ruger upper and Colt's first stab at a mid-length gas system. It was designed with the close collaboration of a small group of elite veteran firearms trainers. It features a 16.1-inch, lightweight, chrome-lined barrel finished with a manganese phosphate. The twist rate is military-standard at 1:7 inches. The handguard is a mean looking, slim profile 13-inch free float model from Centurion Arms. The round vents even extend up the side of the top rail to provide maximum cooling. The handguard features my personal favorite mounting system, the M-LOK, on three sides. Mention AR-style rifles and it's hard to keep Colt from coming to mind. They don't come cheap, but few companies know the platform as intimately as Colt. Not only are they responsible for many of the early developments of the AR, but they have invested in considerable development on this model. The top features are the M-LOK system, the great handrail, and the small details in design and build quality. Yankee Hill is another highly-respected name among manufacturers of modern sporting rifles. This is definitely a name you can trust. The receiver body of this upper has been forged from 7075-T6 aluminum, a standard for AR-style receivers. The flat-top Picatinny rail is T-marked to allow consistent re-mounting of sights and other components. The 16-inch 4140 steel barrel is heat treated and features a 1:9-inch twist rate, which is great for heavier bullets. The barrel is fluted to improve rigidity and cooling. It is also threaded to accept the muzzle accessory of your choice. The upper comes with Yankee Hill’s Phantom 5C2 flash hider-compensator. Atop the barrel is a low-profile gas block. All this is sheathed in Yankee Hill’s Specter Diamond free-float handguard. The handguard has four full-length, T-marked Picatinny rails. The top rail is continuous with the receiver. Inside the receiver, you will find M4-style feed ramps and all necessary internal components, fully assembled. This includes the charging handle and the bolt carrier assembly. Unlike most flat-top uppers, this model comes with flip-up backup iron sights. These are Yankee Hill's own proprietary design. The total weight comes in at 4.4 pounds. This model is made in the U.S.A. and is covered by a lifetime warranty. This is a top-quality upper that will attract attention at the range. The top feature is the complete set of high-grade internal components. 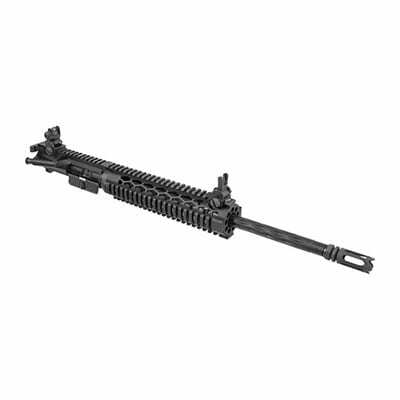 This is a traditionally-styled AR upper from PSA. 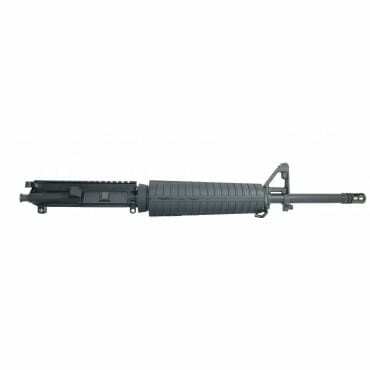 It is relatively similar to the factory original upper on the Ruger AR-556. If you want a drop-in replacement that you will be familiar with, this is a good option. The 16-inch barrel is made of 4150V Chromoly vanadium steel with a nitride finish. It has a classic military standard twist rate of 1:7 inches. This A2-style barrel is melonite treated for accuracy and durability. Everything on the barrel is A2-style as well, including the flash hider and the F-marked front sight base which includes a sling swivel. The handguard is also a rail-free standard A2 model. The gas system is mid-length. Inside the forged receiver you'll find M4-style feed ramps and an M16 bolt carrier group. The BCG is parkerized on the outside and chrome-lined on the inside. It is made of mil-spec, shot-peened Carpenter 158 steel. A charging handle is also included. This upper is made in the USA. Whether you have a reason to replace your stock Ruger AR-556 upper with something similar or just want to maintain that classic military look, this model is a top-quality option. There are no surprises or features that have not been tested through decades of military deployment. The best features of this upper are the choices of materials, alloys, and finishes used. It is also an easy option for anyone that doesn't want to bother shopping around for internal components. A new upper is a great way to personalize and add features to your Ruger AR-556. Whether you're looking for a sleek, mean look, miles of mounting rails, or a top-shelf BCG, you can get it by following our guide to the best Ruger AR-556 uppers.